Mike: [singing] Hope there ain’t eleven. Author: There are twelve! Doctors, that is. Actually 13, as there’s the War Doctor, and also Ten. Crow: Now airing on Sky One! Also on Canal Jimmy, TVM2 and Rai Due! I took a deep breath when I arrived at the TARDIS doors. Crow: ‘Til I finally passed out and the fanfic ended! I turned slowly and looked towards the unbelieving mutants. I unlocked the doors, opened them and went inside. “Well, won’t you follow me, come in!” I told the X-Men. All: [singing] Watch out for that tree! (PU, a couple of minutes back) Tegan exclaimed “Oh my God, that’s the Mara which had taken control of me, way back on Deva Loka! Crow: [Tegan] It might give me a personality or angst or something! A few days ago, The Doctor, Tegan, Nyssa and Adric were travelling in the TARDIS when suddenly something shook the TARDIS. Tegan was certain that the floor and the walls of the rooms of the TARDIS were melting or even disappearing. Tegan had just experienced one of her recurring nightmares. She could not understand why she kept having these since she was now free of the Mara, according to the Doctor. The Mara was a pure essence of evil, a primeval being. She suspected the Mara was responsible for these dreams. On the Kinda’s world, Deva Loka, the Mara had taken control of her mind for its evil purposes, entering our universe in this way. But the Doctor had found a way to banish the Mara back to where it apparently came from, using a circle of mirrors. The truth, however, was there was more than one Mara, and more than one kind. After the Federation had been formed, the earliest Mara (or Maras, it is not known) and its own Sumaran Empire had been defeated on Manussa, the Sumaran Empire homeworld, by the Federation’s flagship – the Enterprise – commanded by a young Jonathan B. Archer (the B. stood for Beckett as in Sam Beckett). The Mara was only banished to what the Doctor called the dark places of the inside. But was there one Mara, more than one, or a large number which were inter-connected like the Borg species were? Sci-fi fans everywhere are not so happy this Christmas with the news of the Cancellation of SGU (Stargate Universe), though TPTB confirmed they are doing all they can, we wil see if something materialises. If not, there will be no more new Stargate for quite some time most likely from what they said and J.Mallozzi said the cancellation of SGU is bad news for those like myself hoping for an SGA or SG-1 movie. This is the crossover fanfic in my series featuring Doctor Who (the Fifth Doctor – played by Peter Davison in the classic BBC tv series) – and the Sliders. Story (C) 2001-2016 Mr SciRev. “The Doctor is a Time Lord – a time-traveller from the alien world called Gallifrey who travels in space and time thanks to his TARDIS which looks like a police box, bigger inside than outside. When the Doctor is severely injured or even killed, he will regenerate into a new appearance and body. He is currently in his fifth incarnation (4th regeneration). His thirteenth will be the last. The Sliders have developed a technique called Sliding which allows them to go to different dimensions or parallel universes, but will they ever find the way to their home universe? After they said their goodbyes – for the time being to Colin – and promised that they would return to pick him up, they left in the TARDIS, it dematerialised. “On the TARDIS viewscreen, Doctor, quick! It’s Colin, stranded in the timestream! Well this is when he met us first. But who’s that woman next to him?” Tegan said. The Doctor manipulated the TARDIS controls so that the TARDIS briefly materialised around the two, in such a way that the two found themselves inside the TARDIS control room, together with everyone else. Quinn asked the Doctor how could this be possible and the Doctor promptly replied that a space-time bubble was formed around the two to allow them to do this. ‘The two are basically all that’s left over from the previous timeline, which was wiped out.’ the Doctor said as a deduction from the results of the scans of the two. ‘They have slipped through the cracks of our reality change just like Colonel Rickman did.” the Doctor smiled. ‘A little problem. We were supposed to have found Colin after Hindle leaves. While Hindle is still here! So this means some reality change has occurred again. I hope it is for the better’ the Doctor continued. Once the two got used to their surroundings, it was clear that the pair were Colin who was stuck between parallel dimensions, due to Dr Geiger’s egotistical experiment in the previous timeline or reality. Dr Geiger wanted to alter the genetic makeup of a handicapped youth, by extracting DNA from the Sliders who travelled between parallel worlds. He had managed to combine the youth with Quinn, who became a single person, which they had called Mallory. But Colin, Quinn’s brother, was left lost within the Sliding Vortex. Until now. The reality alteration resulted in him being freed. But who was the other woman with Colin? “Would he know her”, Wade thought, almost with a hint of jealousy. “I don’t know you Maggie.. if that’s your name. We don’t know you.” Quinn answered. “What? You must be a parallel version of my Quinn.” she replied. “Your Quinn?” Wade was getting angry now. After some time they managed to explain that the previous timeline had been altered drastically. They also explained to Colin how they had met his self from a day or two in the future, and how they would pick him up after he disappeared somehow. Maggie and Colin explained many things which had happened in their original timeline. This included the fact that Maggie’s parallel earth had been wiped out by a pulsar’s deadly radiation. Only Colonel Rickman, herself and a few others from her world had survived, in her timeline. In the new timeline, she was probably dead. She asked whether the Doctor could take them there but he said it probably would involve the Blinovitch Limitation, and that would be dangerous. “The fact you are here means that the version of yourself in the new timeline has died, unfortunately” the Doctor sighed. There really was nothing even he could do. “What about the Remmy from the original timeline? What about Mallory and Diana?” Maggie asked. “The Remmy I was with had just slid to Earth-Prime, after injecting himself with antibodies which can kill the Kromaggs. Has all our effort been destroyed?” she asked. “We have more pressing concerns right now. I can help you deal with your Kromaggs in due course. You should be aware that your timeline’s Colonel Rickman is alive and still sliding as far as we can tell. He attacked all of us here as well as the X-Men.” the Doctor explained. 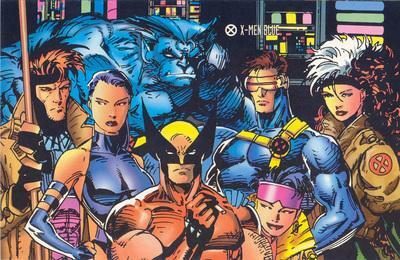 “The X-Men?” Maggie was curious. “Superheroes from a parallel earth – basically people born with an altered mutant genes which give them amazing abilities”, Adric explained. Maggie could only say “Ah”. Years ago she would not have thought superheroes existed, not even in her wildest dreams, but after all she saw in her Slides, this was not an impossibility. Nyssa scanned the surroundings for further potential lifeforms. “One other lifeform is present not far away.” Nyssa said, and prepared for taking the lifeform on board. 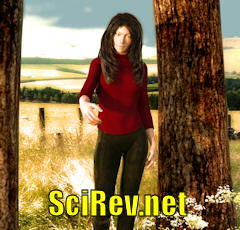 They discovered it was actually Diana, an intelligent scientist who worked for Dr Geiger. She had joined the Sliders in the previous timeline. Maggie was overjoyed to find one other person from the previous timeline, one who shared her memories. She was glad to be still alive, knowing that in this new timeline she should have died on her parallel earth. Suddenly Maggie was thoughtful. Diana asked her what the reason was. It’s when someone takes somebody else’s creation (such as tv, movie or book characters) and invents other fiction using them. It’s taking the characters for a spin, in ways sometimes that the original authors did not conceive of.